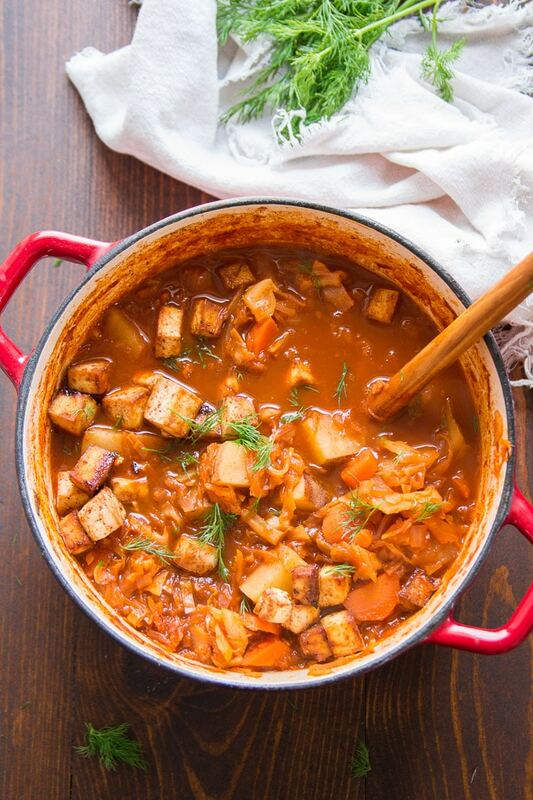 You’ll want to make this meatless version of traditional Polish bigos again and again! 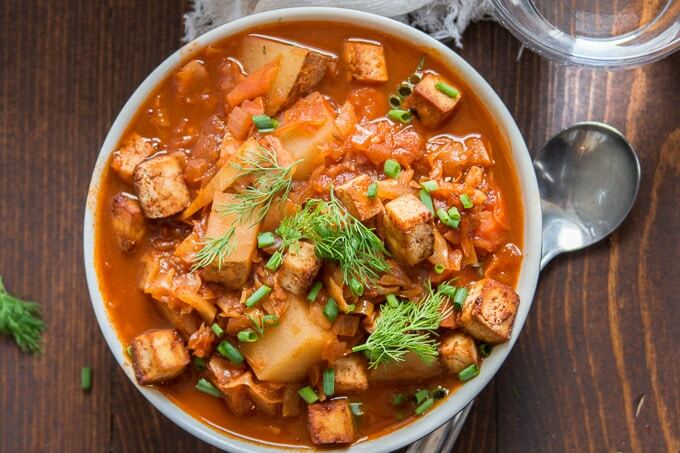 This cozy vegan hunter’s stew is made with a mix of zippy sauerkraut, cabbage, hearty potatoes and smoky baked tofu. A delicious comfort food meal that’s actually healthy! Spring is here, but you sure wouldn’t know it to look at this recipe! This one is about as wintry as they come. It’s still pretty cold out though, at least in my neck of the woods. And last week I started feeling a tickle in my throat, at which point I promptly freaked out because I’d only been recovered from my last bout of illness for about a week at that point. I had a bunch of ingredients and plans to cook up spring recipes, but I just wasn’t feeling it. The tickle in my throat turned out to be allergies, which is the first sign of spring that I’ve seen this year. Anyhow, judging by the lingering cold weather and the number of sneezes I hear (and dodge fearfully) when out and about, I figured maybe I’m not the only one who could use some comfort food. This cozy stew is about as comforting as it gets! Is this one new to you? It’s a Polish dish, and until recently it was to me too, which is amazing because one of the main ingredients is sauerkraut, and I LOVE sauerkraut. Have you ever thought you could make a meal of sauerkraut? I sure have. With this stew, you practically can. Another key ingredient in traditional bigos is meat. Lots and lots of meat, of various kinds. I checked out a bunch of recipes and they call for everything from pork shoulder to sausage to bacon. There’s a reason they call it a hunter’s stew. But this is a vegan site, so you probably don’t want to hear too much about the meat, right? 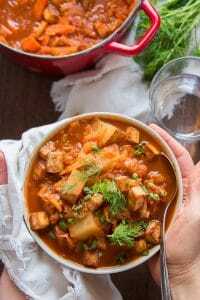 There’s lots of other good stuff in bigos, and the ingredients vary by region, but a few things you’ll typically find are red wine, cabbage, carrots and potatoes. Lots of versions have mushrooms too (I skipped them in this one), and since there’s so much sour from the sauerkraut, a bit of sugar or prunes to balance out the flavor. To veganize this stew, you’ll need to replace the meat. I went with a smoky baked tofu as my meat replacement, because it goes so well with the other flavors in this dish. 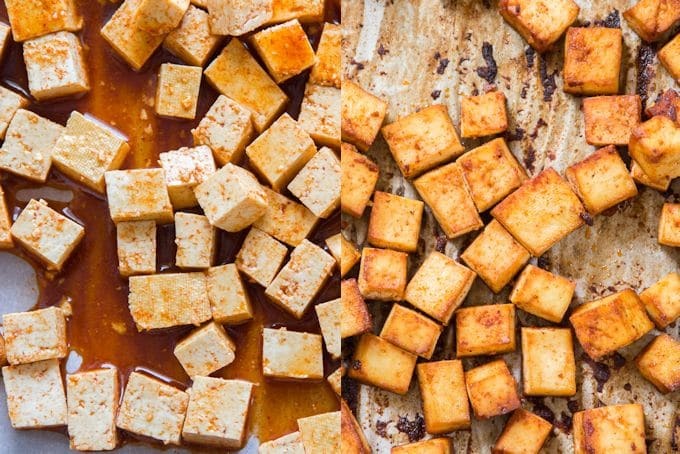 Arrange your tofu cubes on a parchment paper-lined baking sheet and bake them until they shrink up and darken. While the tofu bakes, prepare your stew. Start by sautéing some onion, carrots and garlic in a bit of oil. Once the veggies have softened up a bit, add some red wine, and let it reduce for a few minutes. Next, add the potatoes, cabbage, spices, and broth. Let everything simmer until the potatoes soften up. Sauerkraut, some prunes for sweetness, and tomato paste go in last. Make sure your potatoes are tender before this step, as adding the sauerkraut too early could prevent them from cooking. Let everything simmer for a while longer, then remove the pot from heat and stir in the baked tofu. Serve your bigos with some fresh dill and chives. I love it with some crusty bread for soaking up the broth! If you’re a fan of vegan sausage, feel free to substitute it for the baked tofu. (Or for a super hearty version, use both!) I like Field Roast Smoked Apple Sage sausage with this recipe. Just chop up 3 or 4 links, heat them in a skillet, and stir them into the stew when it’s just about done cooking. Other variations: add some fresh mushrooms or your favorite veggies. You can also sub veggies for the potatoes if you prefer (cauliflower would be nice). If you’re not into prunes, leave them out and sweeten the stew with a tablespoon of maple syrup. 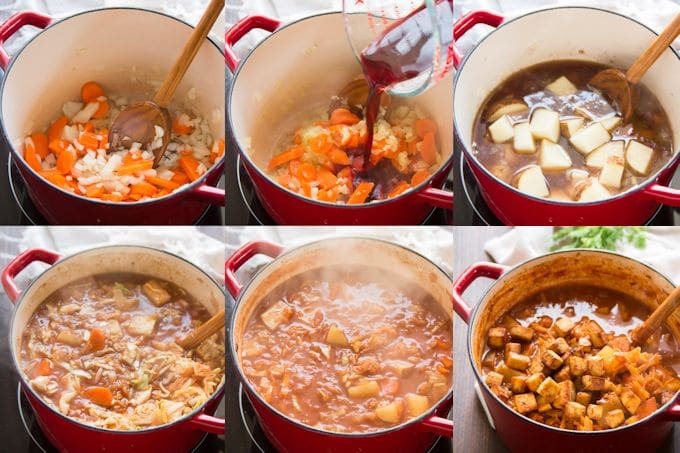 For an alcohol free version, just substitute some extra vegetable broth for the red wine. If you do use the wine, check with Barnivore to ensure your brand is vegan. For a gluten-free version of this stew, use gluten-free tamari instead of soy sauce. 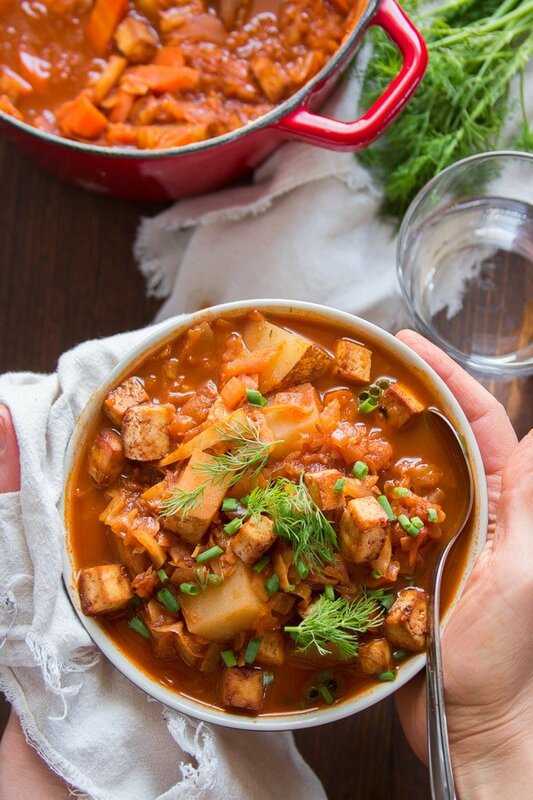 You'll want to make this meatless version of traditional Polish bigos again and again! This cozy vegan hunter's stew is made with a mix of zippy sauerkraut, cabbage, hearty potatoes and smoky baked tofu. A delicious comfort food meal that's actually healthy! Begin by making the baked tofu. Stir the soy sauce, maple syrup, red wine vinegar, liquid smoke, oil, smoked paprika, and black pepper together in a shallow dish. Add the tofu and toss to coat. If you've got time, allow the tofu to marinate for 30 minutes. If not, skip it. 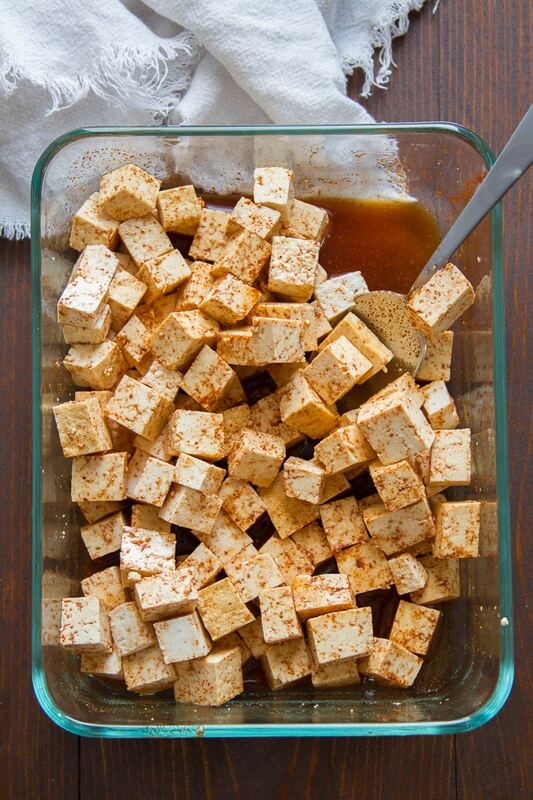 Arrange the tofu in an even layer on the baking sheet, then place it in the oven and bake until the pieces darken and shrink, 35 to 40 minutes, flipping them halfway through baking. While the tofu bakes, prepare the stew. Coat the bottom of a large pot with oil and place it over medium heat. When the oil is hot, add the onion and carrots. Cook for about 5 minutes, stirring occasionally, until the carrots begin to soften up and the onions become translucent. Add the garlic and cook for another minute, until very fragrant. Stir in the wine. Bring it up to a simmer and allow it to cook until reduced by about half, about 5 minutes. Stir in the broth, potato, cabbage, sweet paprika, marjoram, pepper, caraway seed, and Worcestershire sauce. Raise the heat to high and bring the liquid to a boil. Lower the heat and allow it to simmer until the potatoes are tender, about 20 minutes, stirring occasionally. Stir in the sauerkraut, prunes and tomato paste and continue simmering for about 15 minutes more, until the potatoes and cabbage are very soft. Remove the pot from heat and season the stew with salt to taste. Stir in the tofu. Ladle into bowls and top with dill and chives. Serve. I am Polish going back as long as anyone knows. 2nd Generation American. I remember my mother making a type of Bigos with her homemade Polish pork sausage, souerkaut, and apples. I made some last year using Tofukey Andouille sausage. I used a recipe very similar to yours. Except no tomatoes, my mom did not put tomatoes in hers. It was wonderful. My parents were also foragers and picked their own mushroom in the old country Polish tradition. So those were used too. The Tofukey sausage held up really well, I had tired using Seitan but did not hold up as well. I love the idea of including apples – I’m going to try that in my next batch! I’ve been making this a lot and used Field roast sausage in a few batches – it works well! 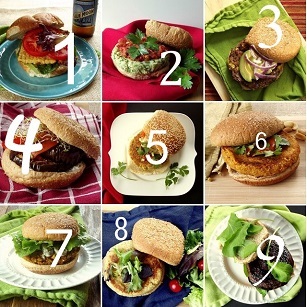 There are so many possible variations to try! Recipe for very simple and tasty bigos-sauerkraut, tomato puree,salt,pepper,garlic,smoked paprika,smoked plums,or raisins,Not potatos in bigos cos this isn’t bigos, bigos is made from sauerkraut with or without tomato puree,spices,smoked plums for aroma and taste,juniper(seasoning) and kiełbasa but it’s easy to replace by tofu.And never ever add potatos to bigos,never,nor broth,or Worcestershire sauce,cos this recipe isn’t bigos.